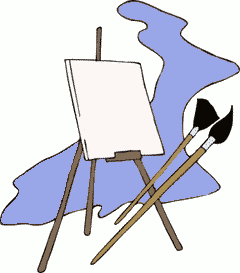 Art 1 emphasizes the study of the basic fundamentals of the visual arts. Students are introduced to the elements of art and the principles of design. Art history is also introduced, as well as the study of some of the major artists. The goal of the course is to provide students with information and assignments that will help them learn how to produce successful works of art and gain an appreciation of the visual arts. After any absence, students must ask for make-up assignments. Students will have 3 days after they return to hand in a missed assignment. Excessive absences and tardies, as well as checkouts, will be dealt with through grade reductions. Art 2 further extends and refines the use of the 7 Elements of Art, as well as the Principles of Design, in the creation of artwork. Emphasis will be placed on the development of an awareness of influential artists, past and present. The goal of the course is to encourage original works of art from each student using several different media. Students are required to purchase a sketchbook. All other supplies will be provided. Students need a pocket folder to keep notes and handouts in. Come to class prepared and ready to learn/work. Respect yourself, your teacher and classmates, and your surroundings. Keep cell phones out of sight. Restroom breaks are to be taken only if necessary and one at a time. You must sign out and take a pass. Work is to be turned in within a reasonable time of the due date.